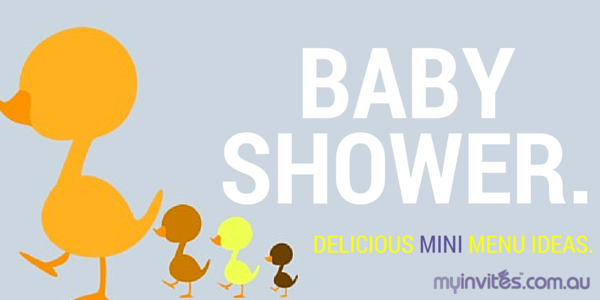 Ideas and Inspiration | MyInvites :: 12 Baby Shower 'Mini Menu' Food Ideas. Feeding a gaggle of friends for your own or your friend’s pre-baby celebration? What a great opportunity to serve up a decadent spread! If the gender of the baby is known, go crazy with pink or blue (or do a mix of the two). And make the most of mini morsels – ‘baby-sized’ bites that are easy to eat while you gossip and play silly games. Tip: don’t forget to avoid those foods that are a no-no for pregnant women – seeing it’s her special day, don’t serve up dishes that contain soft cheeses, deli meats, smoked salmon, raw egg, oysters, sushi, soft-serve ice-cream or pate. Here’s a fab baby shower menu that’ll satisfy your pregnant friend’s cravings as well as fill her guests’ tummies nicely! These are always a treat. Served on a cake stand or tiered treats display they make a fabulous centerpiece. Guests will love these light and fluffy sugary puffs in soft pastels. Easy to pre-make the day before, which is a planning bonus. Pregnant women should eat plenty of fresh, healthy food, so create bite-size fruit ‘kebab’ sticks. Thread toothpicks with balls of watermelon or rockmelon, halved strawberries, whole blueberries and other colourful mini pieces of fruit. Use baby-themed fancy toothpicks for fun. Here’s an easy one – just grab a stack of your favourite chocolate bars, then cover each in a cute, personalised wrapper. Create your own with parchment or brown paper or use baby themed wrapping paper. Add a special little tag with the names of your guests. Get hold of some baby-themed cookie cutters (think rocking horse, teddy bear, baby’s bottle) and punch out yummy favours for guests to take home. Bag in cellophane tied with pink and blue ribbon. Everyone loves classic chicken and mayo sandwich. Cut them in ribbon fingers with crusts off so they can be enjoyed fuss-free. These are tasty and look a bit fancy, even though they are very simple to make! … and if you’re still feeling hungry, remember some old-fashioned mini favourites. We have a gorgeous range of baby shower invitations that you can send online to your guests in minutes. Take a peek here.